So many times, Prabhupada said, referring to his books, “NO Changes!” “Don’t change anything!” but this instruction, given repeatedly, has been glossed over by so many elaborate, and often untruthful, explanations and excuses. The very real danger is that his books could be lost in time, as some changes lead to more changes, and “tinkering” with editing is the disease of the American nature. Prabhupada complained of this “Westerner disease” often, and there is ample evidence that he did not want his books changed after he left this world. 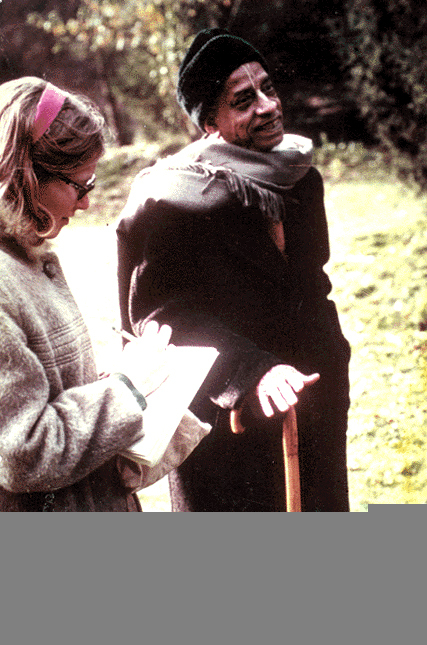 So long as Srila Prabhupada was present, he had the artists and the editors working under him, and he oversaw everything. I personally met Srila Prabhupada in early January of 1967, in San Francisco, and at that time Hayagriva was in San Francisco working daily with Srila Prabhupada editing his Bhagavad-gita As It Is. He had come from New York to the budding San Francisco temple, to continue his editing work with Prabhupada there. Later, in 1968, Hayagriva lived with us in Los Angeles. Srila Prabhupada was in Los Angeles at that time, and daily he and Srila Prabhupada hashed out final details of editing. The Gita was being readied for printing before I went to Hawaii in January of 1969. Earlier in 1968, while living in Srila Prabhupada’s apartment, I did the cover for the first MacMillan edition, the purple one, under his direct guidance and supervision. This was the drawing of Lord Vishnu, and was originally supposed to be the Universal Form. MacMillan removed the extra arms of the Universal Form, making it into Lord Vishnu, and they also condensed Srila Prabhupada’s Gita manuscript down to a much smaller edited version. Srila Prabhupada was not at all happy with MacMillan’s edit–their severe condensation; he was quite satisfied with his complete work at that time — the manuscript that he and Hayagriva had polished and readied, and he wanted the whole thing printed. His entire Bhagavad-gita As It Is was thus print-ready for publication then — in late 1968. However, Macmillan objected to so much repetition in the Gita. Srila Prabhupada told us he wanted the repetition, and that it was necessary for proper instruction to his students. MacMillian simply wanted to save money. So since there was no certainty that the book would sell, MacMillan cut it to the bone. Srila Prabhupada’s lengthy Bhagavad-gita manuscript was cut down to small paperback size for MacMillan’s economical reasons. Yes, he read his books daily, and he spoke from that original Bhagavad-gita for over 10 years! He gave lectures on nearly every verse in that original Gita, and he requested only a couple of corrections, such as “the planet of the trees,” (to be changed to “the pitris”), and a couple of other small corrections. Had only those few changes been made, perhaps this controversy would never have occurred. Hayagriva was, after all, a college professor of English literature since 1964, specializing in the poetic works of the Western transcendentalists–Blake, Merton, Thoreau, Emerson, Whitman, and so on. He had also studied Buddhist sutras, Plato, Saint Augustine, and Hindu books on theology. In 1965, Hayagriva, then Professor Howard Wheeler, went to India in search of a guru, having been inspired by some of his Indian college professor friends. He went seeking a guru, being attracted by India’s sacred legacy. But the real danger is: where does it stop? BBT editors are continuing to edit and re-edit Srila Prabhupada’s books even now. How many editions will exist in 150 years, all bearing the same original 1971 signature of Srila Prabhupada? Jayadvaita Swami joined in the late 60′s or early 70′s, whereas Hayagriva had already been working with Srila Prabhupada closely on the editing since sometime in 1966. Srila Prabhupada gave Hayagriva the service of editing his work at a time when devotees had extensive daily access to Srila Prabhupada. We would spend hours in his room, and he would talk with us about Krishna consciousness, and almost anything and everything. If you will look at Hayagriva’s book, The Hare Krishna Explosion, written from diaries recorded long before the “book editing issue” surfaced (and long before Jayadaita or Dravida became devotees, and even before BBT was formed) you will see that Hayagriva was spending time daily with Srila Prabhupada doing this editing work. It is an undisputed fact, clearly written in Hayagriva’s diaries from 1966 and 1967. Jayadvaita Swami, for some reason, ignores this and claims that Hayagriva spent little time with Srila Prabhupada editing his books. This is simply not true. The fact is that Jayadvaita Swami wasn’t there yet. I was. I am an eyewitness to the elaborate editing conversations that took place in 1967 and 1968. My husband, Gaursundar, and I even met with MacMillan in New York to discuss the cover, since my drawing was to be used. We were very involved with the whole process. That first Gita, the purple one, was printed only a few months after I went to Hawaii in January of 1969. In late 1968, just prior to my departure for Hawaii, Hayagriva was in Los Angeles, staying with us for several weeks in Prabhupada’s apartment, and working daily on the final polishing of the manuscript for the MacMillan Gita, as well as other books. It was at that time that Prabhupada married Hayagriva to Shama dasi. For over a year, from late 1967 to early 1969, I was Srila Prabhupada’s secretary and cook, while my husband Gaursundar, gave massages to Srila Prabhupada daily, and also took him for morning walks. I usually stayed at home to clean Srila Prabhupada’s room and in order to have his breakfast ready when he returned. During that amazing year, we traveled with Srila Prabhupada from city to city, assisting him in his publications, and helping to arrange a comfortable home situation for him. Aside from taking dictation from Srila Prabhupada for letter writing and correspondence, my job at that time was also transcribing the tapes for Nectar of Devotion and Caitanya-caritamrita. Srila Prabhupada would rise in the wee hours of the morning, around 2:00 am, and spend hours speaking his books into his dictaphone. Later in the morning, he would hand me a tape to type–even sometimes two tapes! Gaursundar was a Sanskrit and Bengali scholar, so he was transliterating Caitanya-caritamrita, and discussing the forthcoming production of Caitanya-caritamrita with Srila Prabhupada at every opportunity. That was his service. 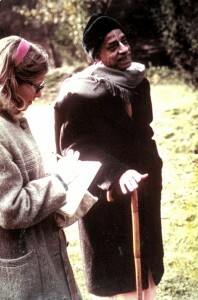 Prabhupada oversaw the editing work just as carefully as he supervised the artwork. For example, I had never been to India, and certainly not to Jagannath Puri. Yet Srila Prabhupada described the inside of Lord Jagannath’s temple so that I could draw the scene of the altar. He supervised everything. Srila Prabhupada was very involved with every part of his book production process, from the conception of paintings to the final choice of size and color. There is some erroneous idea promoted by BBT-edit that Prabhupada spent very little time with Hayagriva and that he did not closely watch over the work of the editors and artists. I did not perceive this to be true. Now, so many years have passed. Jayadvaita Swami seems to think this book issue is a “political controversy.” BBT finances him to travel around from temple to temple, all over the world, with his neatly packaged presentations on why Srila Prabhupada’s books have been edited and changed so drastically. I have no personal dislike or antagonism for Jayadvaita Swami, or for Dravida Prabhu. We were always friends. But this issue is one that we cannot agree upon, because it is clearly a disregard for Srila Prabhupada’s platform as Acharya. And it threatens to dismantle the entire mechanism that Srila Prabhupada set in motion. The Bhagavad-gita As It Is has been changed so drastically that it no longer even sounds like the same book. Now, I am not saying it is useless; I think every devotee should get both copies and compare them. But please understand, the original unedited Bhagavad-gita As It Is is the one that Srila Prabhupada sat and read daily in his room, the one he gave public lectures from, and quoted from on many, many occasions — for over 10 years! Are we to also edit his spoken lectures? Or are we to appreciate that his transcendental voice is coming from a realm far beyond our minds, far beyond this universe? When Jayadvaita Swami came here to Hawaii about ten years ago, I had a darshan (one of the very few that I have had since Srila Prabhupada’s departure…) of Srila Prabhupada in my temple room. In that brief darshan, Srila Prabhupada ordered me, “I want you to speak!”, indicating he wanted me to speak out about the book changes, and to address Jayadvaita Swami. My first response was “I don’t wanna…” (who wants to go before a firing squad?) Srila Prabhupada’s response was commanding: “You have to, that is my order…they will listen to you!” At that point I agreed, what else could I do? I then educated myself more thoroughly on the whole issue. Subsequently, several discussions were held at the Honolulu temple, with Jayadvaita Swami, where a number of other senior disciples came to voice their grievances and opinions as well. Those discussions were taped and later transcribed and can be found on www.Adi-vani.org. And now on another website known as www.BookChanges.com, and perhaps other places as well. Since then, I have studied the lawsuit that cost the BBT over a million dollars to defend the edited book changes– a lawsuit that was lost, and that BBT is careful not to discuss or mention. Or if they do mention it, it is done so in a very misleading manner. Let me add here, that in the BBT lawyers’ arguments, BBT labeled Srila Prabhupada as a “writer for hire” and therefore his books belonged to BBT and could be edited however they pleased. This argument, albeit only a legal agenda, is clearly great aparadha. AND it is unlikely they would EVER have been back in print, without this costly million dollar court case. We know this, because one senior Prabhupada disciple had the money, and asked to print a small run of the original Bhagavad-gita As It Is for the Prabhupada Centennial. Her requests were ignored by the BBT. And if for some reason, a writer’s works ARE posthumously edited, it is a rule in the publishing industry that the work is no longer considered to be only the author’s work, but an edited version of it. And thus it is required that the editor’s name is on the cover as well–not just Srila Prabhupada’s name, as has been done by the BBT. The rule is that the public must know up-front that the book has been edited and/or abridged by so-and-so. That means, the edited Bhagavad-gita As It Is should have on the front cover, ‘edited posthumously by Jayadvaita Swami, and/or Dravida das’. Why do BBT consider they are above such accepted industry protocol, and thus present an edited version, done posthumously, with Srila Prabhupada’s 1971 signature — as if he were here to authorize the edits? In educated circles, this is not only considered unscholarly, it is considered unethical. I also researched whether such posthumous editing was done in our Gaudiya Vaishnava tradition. To find out whether this is acceptable in the Gaudiya Vaishnava tradition, I approached HH B. V. Narayana Maharaja with questions about this matter. He told me clearly that this was not to be done to the writings of an Acharya. His exact words were, “they have lost Swamiji’s voice” in this posthumously edited Bhagavad-gita. I have not approached other scholars and/or religious leaders, but I intend to do so. Srila Prabhupada is concerned about the loss of his gift to the world — his books. It is not that they are completely lost now, with this one edit. But they will continue to edit, and change, and change again, and again. The editors that come after Jayadvaita Swami and Dravida Prabhu are gone will surely have new and different ideas, and in due course of time, the pure teachings will be lost. Just like the instructions Krishna gave to the Sun God. 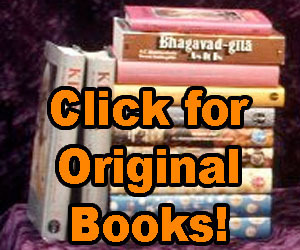 Just as Krishna says in the Gita that “I gave this knowledge to the Sungod, but it was lost in the course of time,” the same thing will happen to Srila Prabhupada’s books if we allow this book change issue to go unchecked. There is no end to it. Srila Prabhupada’s communication to me is that this is the single most important issue. And that every one of his faithful disciples should speak out on this issue, whether we are criticized or not. It really isn’t about Jayadvaita Swami or any particular person. Anybody can make a mistake; we are all conditioned souls. Rather, it is about keeping Srila Prabhupada’s teachings intact for the future welfare of mankind. Two hundred years from now, when scholars are researching this great movement, and they find thirty editions of the Bhagavad-gita As It Is, all bearing Srila Prabhupada’s 1971 signature, how will they even know which edition is the original and authentic one? They will know only by the statements that we, Prabhupada’s disciples, leave behind. Therefore, it is our duty, to be faithful to our Guru, to speak out to defend his books, even if it makes us unpopular. Amazingly, some respected ISKCON leaders have been known to criticize the original books, calling them “Ritvik books!” Yet those same leaders became devotees from reading those original books! This BBT propaganda is not coming from Jayadvaita Swami or the BBT; it is coming from the Kali Chela, who are working diligently to infiltrate this great movement launched by Srila Prabhupada — a movement launched with a handful of sincere American teenagers who loved their “Swamiji”, and continue to love him, more than life itself. Dear Devotees, please don’t take all this for face value; do your own research, offer your own prayers to Srila Prabhupada, and then decide what is right. Don’t simply parrot the propaganda that BBT is spreading to try to make it all sound all right. As a disciple, you and I and every one of us has a duty to Srila Prabhupada, to his legacy, to safeguard his valuable teachings for the generations of devotees to come. That is our most important duty. This is one devotees memory of events as they occurred. But whether or not some of it was imagined or factual is not the issue. The issue is simply that Srila Prabhupada made a very strong and repeated order that his books not be changed. Even the reasons that we attribute to him for giving these orders are not the real issue. The fact simply remains that that Srila Prabhupda gave us those instructions. These memories are nice of course. Many of us have similar memories of Srila Prabhupada. But leaving all conjectures aside, let it be enough that Srila Prabhupada gave us that order. That should be sufficient in and of itself. What more requires to added?